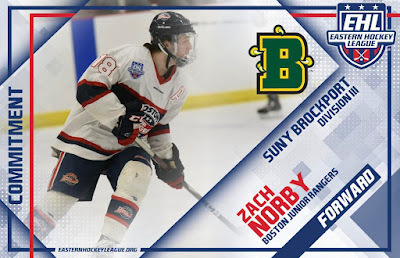 Zach Norby, a forward for the Boston Jr. Rangers, has committed to SUNY Brockport for the fall of 2019. The '98 native of Bristow, VA spent the last three seasons with the Rangers organization, playing at both the Eastern Hockey League (EHL) and the Eastern Hockey League Premier (EHLP) levels. "We are very proud to announce Zach's commitment to Brockport,” said Rangers head coach and general manager Rich DeCaprio, “Having recruited him 3 years ago, and seeing the strides he’s made not only as a player but as a human, has been very rewarding as a coach. He has been a great teammate and very easy player to coach. His skill set and IQ are well above average and his perseverance is right there as well. Zach will have a great college career." Looking back at Norby's first season with the Rangers, and he played a key role on the 2016-17 EHLP team that reached the finals. That season Norby scored 20 goals and dished out 30 assists in 48 total games. Following that season, Norby went on to spend the past two years with the Rangers' top team, tallying 82 points in 107 career games in the EHL. Overall, Norby put together a solid three-year career with the Rangers, and for that he is very grateful. While the Rangers season ended soon than they had hoped, Norby and his teammates still have plenty to be proud of with what they accomplished this year. Norby will now set off for Brockport in the fall, where he will be joined by his teammate Aiden Curry, who made the same decision back in December. Yesterday on Twitter, Scott Ramaekers announced his commitment to Brockport. 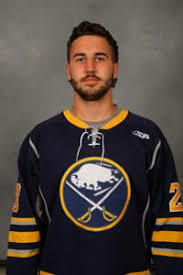 The forward spent the last two seasons with the Buffalo Junior Sabres of the OJHL. In 102 games over those two campaigns he amassed 22 goals and 23 assists. Brady Farkas at 101.3 FM in Burlington/Plattsburgh is reporting Plattsburgh's Bob Emery has retired. Wow. I heard rumors all season but didn't think they were true. 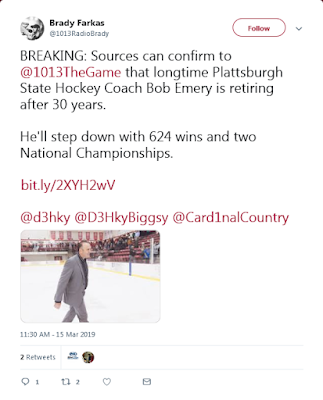 Of all of Brockport's SUNYAC rivals I always liked watching Bob Emery's Plattsburgh squads. He coached with an edge and a focus on self-discipline and awareness of the task, and he had amassed and nurtured some great talent. 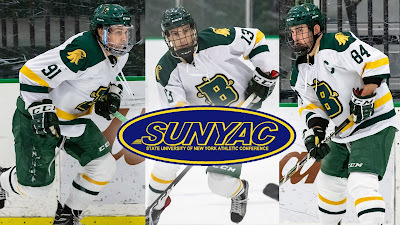 Three College at Brockport student-athletes have been named to one of the three 2019 Men's Ice Hockey All-State University of New York Athletic Conference (SUNYAC) teams, as announced Thursday by the conference office. Sophomore defenseman Ryan Romeo was tabbed to the All-SUNYAC Second Team, while Junior forwards Connor Hutchins and Doc Gentzler were selected to the All-SUNYAC Third Team. Romeo back-boned the Brockport blue line this season, finishing the '18-'19 campaign second on the team in points with 17 (4g-13a). His 17 points on the year placed him fourth amongst all SUNYAC defenseman. The sophomore defenseman from Fairport, N.Y. was an impact player for the Green and Gold all year, his best game coming in a 3-0 win over Neumann College where he had a goal and an assist. Hutchins, a center on the Golden Eagles top line helped the Green and Gold to their best season in 30 years. The junior from North Richland Hills Texas lead the Golden Eagles in points this season with 26 (8g-18a). Hutchins top game this year came in a 7-3 win over Lebanon Valley on Jan. 12, as he recorded two goals and added two assists. Gentzler rounded out the Brockport offense with his gritty style of play that made him a nightmare for the opposition's defense. Gentzler lead the forecheck for the Green and Gold and added a flash of skill while doing it. The junior forward had a breakout season for the Golden Eagles touching the double digits for the first time in his career with 14 (9g-5a). Gentzler lead the team in goals this season with nine. It was a record setting season for senior goalie Jake Moore. The College at Brockport ice hockey team fell to Plattsburgh State Wednesday night, by a score of 3-1. With the loss, the Golden Eagles are eliminated from the SUNYAC post-season, finishing the year with a final record of 15-9-2. The Cardinals will advance to the SUNYAC semi-finals. The Golden Eagles wasted little time getting on the board in the first period as Aidan Salerno beat the Cardinals netminder a little over two minutes into the game. The Green and Gold had the Cardinals on their heels from their first goal, outshooting Plattsburgh 14-8 in the first. Brockport went to the powerplay three times in the first period but couldn't find their second goal of the night. The second period was more of the same from the Green and Gold, pressuring the Cardinals at all ends of the ice. The Cardinals went to the PP twice in the second period but the Brockport penalty killers held the door shut. Brockport netminder, Matt Schneider made a few saves to end the period, allowing the Golden Eagles to hold onto their one goal lead. The Cardinals broke their goal drought six minutes into the period, finding a loose puck in the slot and putting it past Schneider. Moments later, the Cardinals were at it again, scoring their second of the night, and taking the lead, 2-1. The Golden Eagles were awarded a five-minute PP with 10 minutes remaining, Captain Connor Hutchins and Freshman Corey Tam traded off scoring opportunities but the Plattsburgh goalie shut the door. The Cardinals went to the box again with 1:55 remaining in. the game, giving Brockport the man advantage for the remainder of the game. As a last chance effort, the Golden Eagles pulled Schneider giving them a 6 on 4 opportunity, the Cardinals found a loose puck and fired it into the Brockport empty net. PLATTSBURGH, N.Y. – The third-seeded Plattsburgh State men's ice hockey team begins its quest for its 24th conference title on Wednesday evening at the Ronald B. Stafford Ice Arena, as the Cardinals host sixth-seeded The College at Brockport at 7 p.m. in the first round of the State University of New York Athletic Conference (SUNYAC) Tournament. TICKET PRICING: Tickets are $7 and can be purchased either at tickets.plattsburgh.edu or at the box office starting at 5 p.m. on the day of the game... Students from SUNYAC schools with valid identification will be admitted free of charge. ABOUT THE SERIES: In a series that dates back to 1975-76, the Cardinals are 82-5-5 all-time against the Golden Eagles… Plattsburgh State was 1-0-1 against Brockport this year, battling the Golden Eagles to a 1-1 overtime tie on Nov. 10 at home before posting a 4-1 victory over Brockport on Jan. 26 on the road. ABOUT THE CARDINALS: Plattsburgh State is in the SUNYAC Tournament for the 28th consecutive season and enters Wednesday's game riding a four-game winning streak... The Cardinal offense is led by senior forward Cam Owens and freshman defenseman Matt Araujo, who have a team-high 14 points apiece. Owens is tied for the team lead in goals with seven, while Araujo has a team-leading 12 assists, which is tied for 21st in the SUNYAC… Sophomore goaltender Jimmy Poreda has enjoyed a breakout season in goal for the Cardinals, earning four SUNYAC Goaltender of the Week honors this year… He ranks among the NCAA Division III leaders in save percentage (ninth, .936), shutouts (tied for 11th, 3) and goals-against average (13th, 1.86)… Plattsburgh State boasts Division III's top penalty kill (.913) and is tied for 24th nationally in scoring defense (2.44 goals allowed per game)… Head coach Bob Emery is in his 30th year piloting the Cardinal men's ice hockey program and boasts a career record .of 623-214-65. 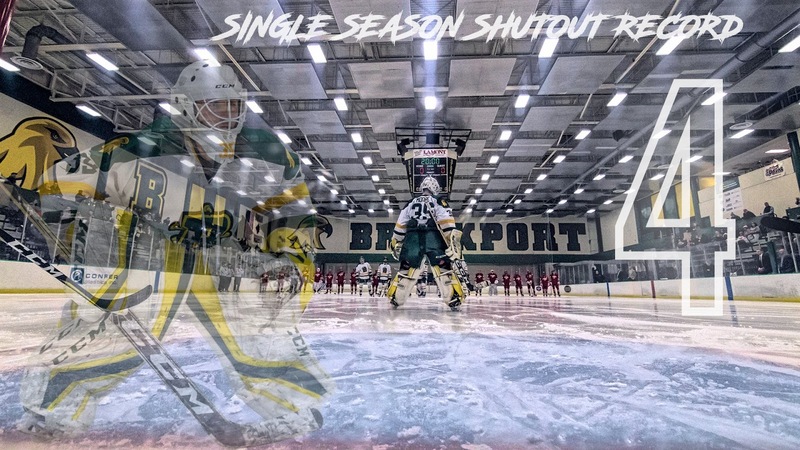 ABOUT THE GOLDEN EAGLES: Brockport is making its first appearance in the SUNYAC Tournament since 2015-16 and is in pursuit of its first-ever SUNYAC championship… The Golden Eagles' 15 wins so far this year are the most a Brockport men's ice hockey team has achieved since 1987-88… Brockport has been a thorn in the Cardinals' side the past few years with a 3-2-1 record against Plattsburgh State during that span, including a 1-1-1 mark at the Ronald B. Stafford Ice Arena… Brockport is led offensively by junior forward Connor Hutchins, who has a team-leading 26 points on eight goals and 18 assists… Sophomore defenseman Ryan Romeo leads the blueliners offensively with 17 points (4g, 13a)… Senior goaltender Jake Moore has been a steady presence in goal this season, ranking among the Division III leaders in shutouts (tied for fifth, 4), goals-against average (17th, 1.93) and save percentage (tied for 29th, .925)… Brockport is tied for 12th in Division III in scoring defense (2.00 goals allowed per game) and ranks 23rd nationally in scoring margin (1.04)… Head coach Brian Dickinson is in his 22nd year at Brockport and is in his 25th season overall as a head coach… He boasts a career overall record of 210-371-58. WHAT'S NEXT: Fourth-seeded Buffalo State is hosting fifth-seeded Fredonia in the other first-round game... The lowest remaining seed will visit top-seeded SUNY Geneseo in the semifinal round, while the second-lowest remaining seed will visit second-seeded Oswego State in the semifinals. 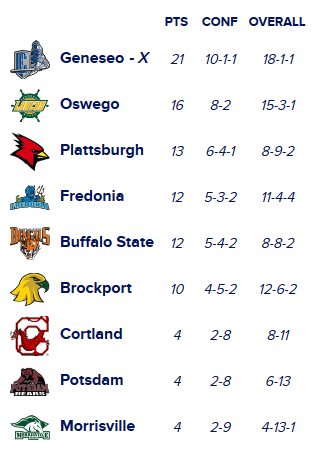 The playoffs begin Wednesday and all hopes are on Brockport making this magical season continue. They will be traveling to Platsburgh. In two games this year the teams tied 1-1 and then the Cardinals beat Brockport at Brockport 4-1. The Golden Eagles have to apply pressure against a defensive team that allows a solid 2.44 goals per game and got better as the season went on. Of benefit to Brockport's even-better defense (2.00 goals per game), Plattsburgh's goal output ranks only 57th in all of DIII (2.60 goals per game). They have 3 guys with 7 goals and none more than that. They don't even have a 15-point scorer! Highly unusual for a Bob Emery team. Jimmy Poreda has been their savior in goal with a .936 save percentage. It will take some gritty lunchbucket goals to beat him -- he'll stop flash every time. It's going to be a hard-fought, physical game in a tough environment. 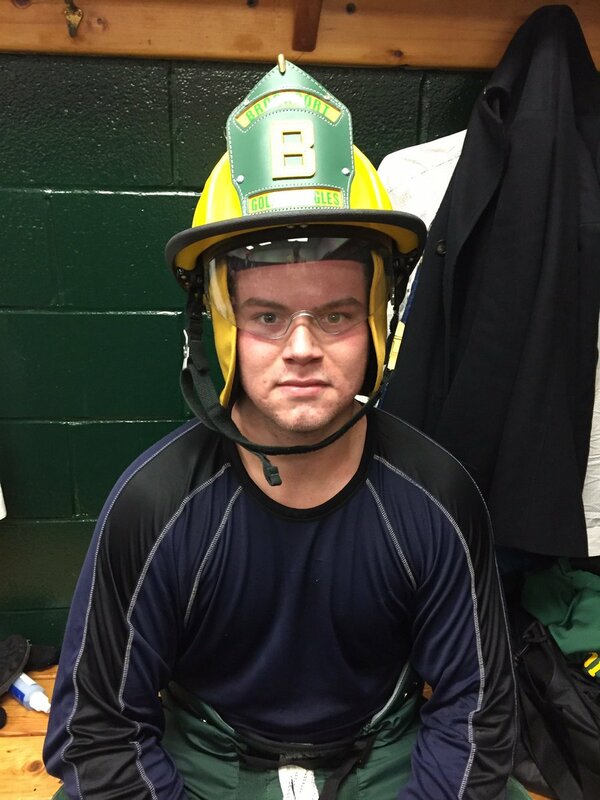 The College at Brockport ice hockey team fell to No. 2 SUNY Geneseo Friday night, by a score of 6-3. With the loss, the Golden Eagles move to 15-8-2 overall and 7-7-2 in conference, while the Ice Knights move to 22-1-2 and 13-1-2 in the SUNYAC. The Golden Eagles were in a dog fight from the drop of the puck Friday night against the Ice Knights. It was Geneseo who found the back of the net first, scoring ten minutes into the period, Jake Moore made the initial save but the rebound squeaked by him. The Ice Knights extended their lead a little over a minute later, bringing the score to 2-0. Brockport went to the PP twice in the first period but couldn't find the back of the net. Brockport started the period man-down as Ryan Romeo went to the penalty box at the end of the first period for a tripping call. Romeo sprung from the box a minute into the period and found himself on a breakaway after a long pass from Doc Gentzler, Romeo snapped off a shot that beat the opposition's netminder over his glove side, narrowing the score, 2-1. Two minutes later the Knights scored their third of the evening to bring their total to three goals. Less than 30 seconds later, Aidan Salerno fired a puck on net that beat the Geneseo goalie, once again, bringing the Golden Eagles within one. Four minutes after the Brockport goal, Geneseo scored again, this time on a tic-tac-toe passing play that snuck past Moore. The Ice Knights added one more goal to end the period, sending Brockport into the locker room down, 5-2. The Golden Eagles looked to battle back in the third as they took the play to the Ice Knights early on in the period. The Green and Gold went to the PP at 9:15 of the third period and capitalized on the opportunity, the third Brockport goal of the night was scored on the rebound by Gentzler after a one-timer off the pads from Connor Hutchins. Geneseo would extend their lead to three at 12:39 of the third, for a final score of 6-3. What would it take to host a playoff game? This shows the standings with one week left to play. Brockport sits in fifth place and is in the playoffs. What would it take to get a home playoff game (third and fourth place)? Brockport HAS to win the Friday game against Geneseo, the #2 team in the whole country. That would have them end the season with 18 points. 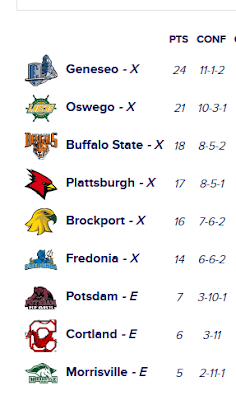 Then, there has to be a little help: Buffalo State currently has 18, Plattsburgh has 17. If Buffalo State wins Wednesday against Geneseo, they secure third or fourth place. If they lose and Brockport wins Friday and they remain tied with Brockport at 18 points, Brockport wins the tie-breaker after having defeated Buffalo State twice this season. Then there's the issue of Plattsburgh. They have two conference games left, one against Cortland (which they should win) and another against Oswego (which will be tough). The biggest thing...Brockport HAS to win Friday to even have a chance of hosting a playoff game. It's going to be tough. Geneseo excels in all facets of the game. They are the toughest opponent all year. The College at Brockport ice hockey team defeated SUNY Cortland Saturday night, by a score of 5-1. With the win, the Golden Eagles move to 15-7-2 overall and 7-6-2 in conference, while the Red Dragons move to 9-14 and 3-11 in the SUNYAC. The Golden Eagles came out flying in their second game of the weekend; dominating the Red Dragons from the drop of the puck in the first period. The Green and Gold wasted little time getting on the board as Ethan Solat scored the first goal of the game six minutes into the period with assists to Chris Pollini and Bryan Carville. Two and a half minutes later the Golden Eagles were at it again, Jordan Renaud found the back of the net with assists from Shane Visnick and Danny Rock. Brockport would make it three unanswered goals in the first period as Renaud tucked in his second of the night with five minutes remaining assisted by Ryan Romeo. The Golden Eagles headed into the locker room with a three-goal lead. Brockport continued their dominance to start the second period as Danny Rock scored the Golden Eagles fourth goal of the game three and a half minutes in. The Red Dragons narrowed the score to three goals on the PP with five minutes remaining in the period. Brockport answered the Cortland goal two minutes later, Tyler Williams scored the Green and Gold's fifth goal of the night assisted by Connor Hutchins and Ethan Solat. The Red Dragons started the third period with a powerplay opportunity but the Golden Eagles PK unit stood tall, holding the Cortland attackers to a single shot. The two teams skated to a scoreless third period. Brockport senior netminder, Jake Moore had another stellar outing making 21 saves on the night. Despite last night's loss to Oswego, Brockport secured a playoff berth. They are sixth in the conference with two game left to play. 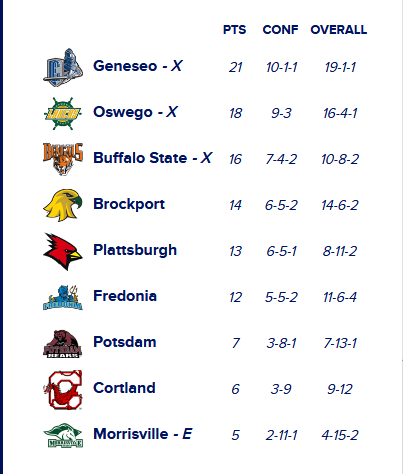 They are tied in points with Fredonia and just one point behind fourth place Plattsburgh and two behind third place Buffalo State. Can Brockport get to third or fourth and host a playoff game? Anything can happen by the close of the regular season in the SUNYAC. Anything! But, first, Brockport takes on Cortland on the road tonight. The Red Dragons are 9-13 overall and 3-10 in SUNYAC play. It's certainly a game the Golden Eagles can win....and HAVE to win. Cortland has just 4 players with 4 or more goals, and only one with more than 5, Alex Storjohann, who has 9. So, Brockport's stingy D will likely have an exceptional game. It's the other end of the ice where things are totally different. Junior Nick Modica is a special kind of awesome in goal. He has a .935 save percentage, a 2.59 goals against average, 2 shutouts, and a staggering 752 saves. The team is all him. He's kept Cortland -- a team that is 74th in the nation in scoring at 2.09 goals per game -- in almost every game. If you've ever wanted to see a one man team, this might be it. He's the kind of player who makes you wonder -- could you vote for a player on a last place team for conference MVP? 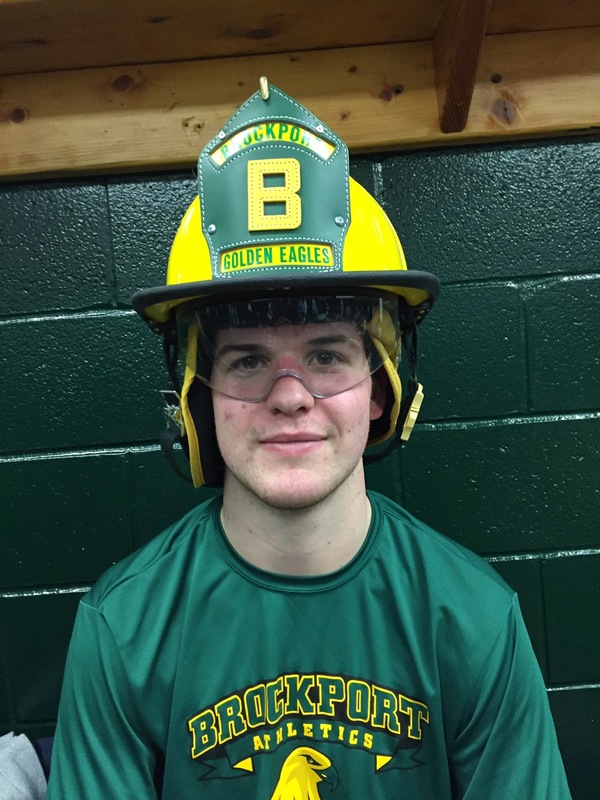 The College at Brockport ice hockey team fell to No. 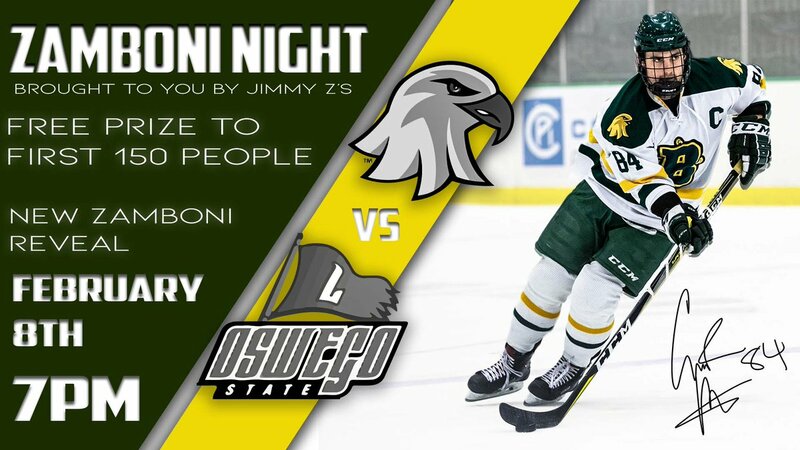 4 Oswego State Friday night, by a score of 3-0. With the loss, the Golden Eagles move to 14-7-2 overall and 6-6-2 in conference, while the Lakers improve to 17-4-1 and 10-3-0 in the SUNYAC. The Golden Eagles came out to a roaring crowd of 2200 in the first period of this SUNYAC matchup. The electric atmosphere propelled the Golden Eagles to a hard fought first period, going toe-to-toe with the Lakers from the puck drop. The Lakers would take lead eight minutes into the period on a five on three advantage. Brockport went to the PP one time in the first period but the Lakers penalty kill stood tall. Brockport outshot Oswego 11-6. The second period was some of the most exciting action we've seen from the Golden Eagles all year. The two SUNYAC rivals played back and forth hockey for the entire 20 minutes of play, with the Golden Eagles outshooting the Lakers, 14-9. The Brockport PP had a few chances in the second period but came up short against the Oswego PK unit. The Lakers extended their lead to two with a minute and a half remaining in the period. Brockport had a slow start in the third period as the Lakers controlled possession for the first five minutes. The Golden Eagles regained their momentum as they headed to the powerplay in the third. The Green and Gold had their chances on the PP but could not get the puck past the oppositions netminder. The Golden Eagles took the game to the Lakers the entire third period, outshooting their opponent, 8-7; but it was the Lakers who would put the final point on the board, scoring an empty netter to finish the game, 3-0. There are only two regular season home games left in what has been a magical season. One of those takes place this Friday when the Golden Eagles host Oswego. They are a powerhouse, ranked 4th in the country. They are 16-4-1 overall, 9-3-0 in conference play. They are a fine 4-2-0 on the road. Last week they were shocked by Buffalo State in a 6-5 battle. They have a very balanced attack -- 8 guys have at least 6 goals, led by Joe Molinaro (11) and Josh Zizek (10). David Richer has started in goal for most games and has a .900 save percentage to go with a 2.10 GAA. When these teams met in the first semester, the Lakers declawed the Golden Eagles by a score of 5-2. 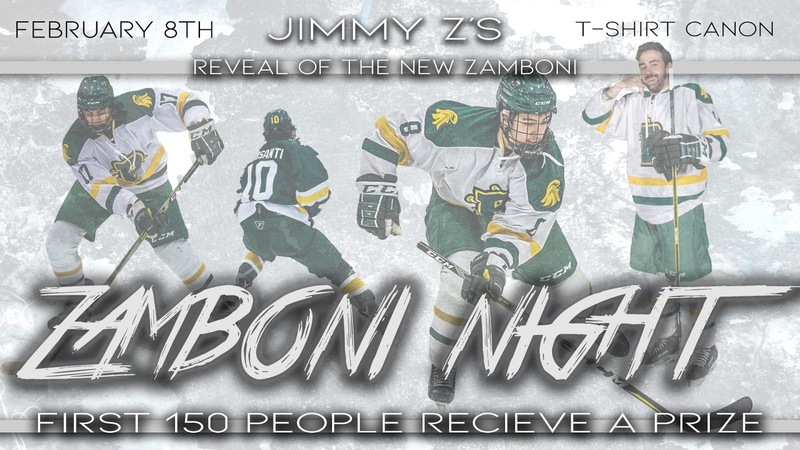 It's a special night Friday as there will be a reveal of the new Zamboni, t-shirts will be blasted into the crowd, and the first 150 students get a prize. This has been a special season, so get out and enjoy the special night! 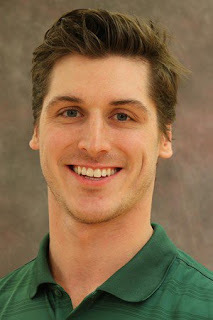 Trevor Pray was selected as Brockport's Athlete of the Week. 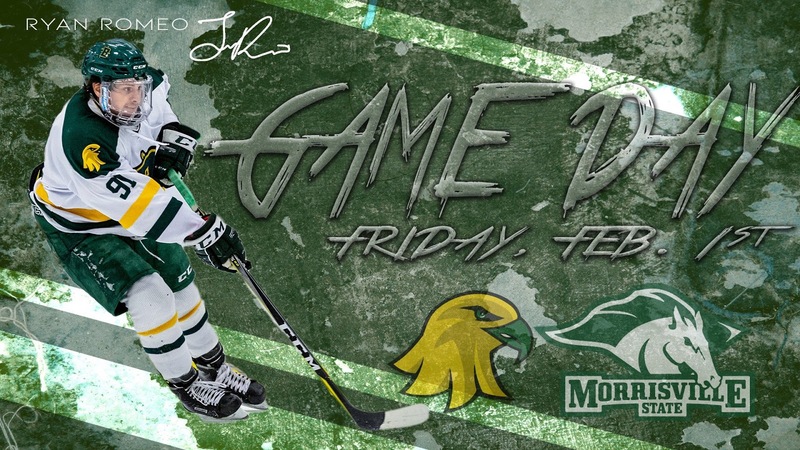 The freshman forward had a stellar weekend against the Morrisville Mustangs, scoring twice in Friday's 6-1 victory and once in Saturday's 5-1 win. 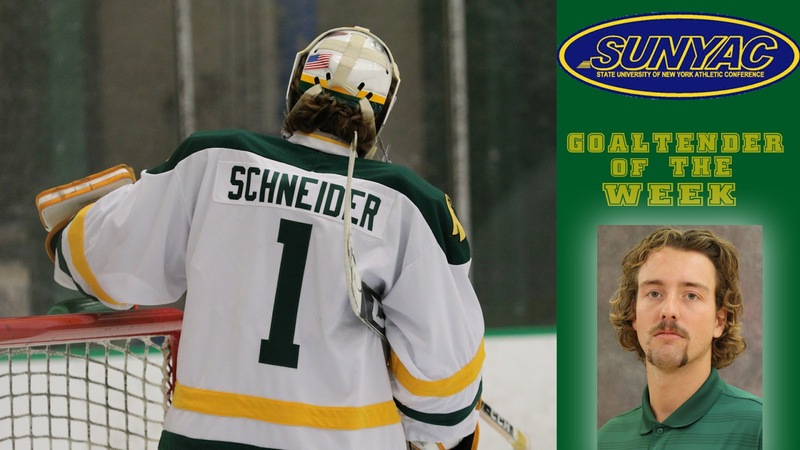 The State University of New York Athletic Conference (SUNYAC) announced its weekly honors Monday afternoon, and The College at Brockport Junior netminder, Matthew Schneider has been selected as the goaltender of the week. Schneider had a stellar weekend for the Green and Gold, making ten saves in Brockport's 6-1 win over Morrisville State Friday night, and another ten save performance in their 5-1 win on Saturday. Over a two game span Schneider turned away all but two shots, posting a 1.00 goals against average (GAA). 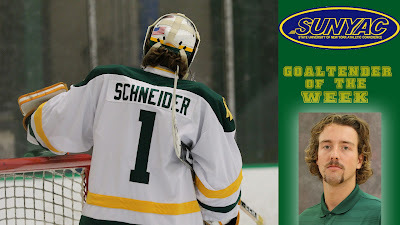 Schneider boasts an overall record of 4-1-1 when between the pipes for the Golden Eagles this season. 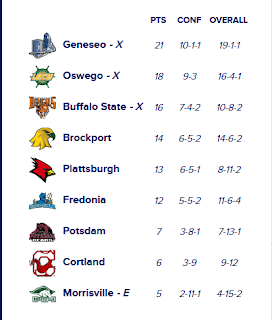 The SUNYAC standings shows how important the two dominant wins were this weekend. 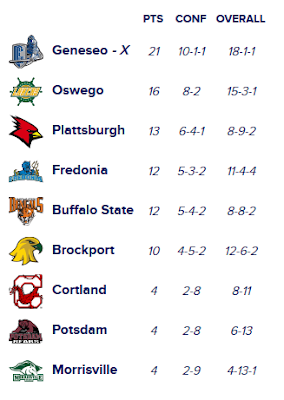 Brockport is now in fourth place in the SUNYAC (which would see a home playoff game) with 3 games left to play. Now comes the hard part of keeping that slot! Good luck, men! 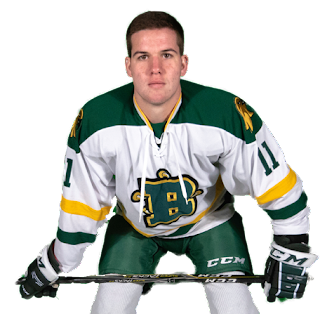 The College at Brockport ice hockey team completed the weekend sweep of Morrisville State Saturday night, winning by a score of 5-1. With the win, the Golden Eagles move to 14-6-2 overall and 6-5-2 in conference, while the Mustangs fall to 4-15-2 and 2-11-1 in the SUNYAC. The Mustangs ran into penalty trouble in the first period, sending the Golden Eagles to the powerplay five times in the 20-minute span. Despite the Brockport advantage, the Green and Gold didn't score their first goal of the game until 16 minutes into the period. Ethan Solat opened the scoring at 4:26 of the first period with assists to Casey Winn and Connor Hutchins. The Golden Eagles opened the floodgates in the second period, scoring four out of five of their goals on the night in the 20-minute frame. The Golden Eagles extended their lead six minutes into the period as Robby Flannery found Shane Visnick for his second goal of the season. The Golden Eagles scored again two minutes later on the PP; Doc Gentzler beat the opposition's netminder with assists to Danny Rock and Ryan Romeo. The fourth Brockport goal of the night came two minutes later as Connor Hutchins netted his eight of the year with assists from the Solat brothers. The Mustangs answered back with a goal of their own minutes later, bringing the game within three goals. The Golden Eagles hot-hand Trevor Pray silenced the comeback moments later, scoring his third goal of the weekend with assists to Visnick and Flannery. The Golden Eagles dominated the third period but came away empty-handed in the goal scoring department. Brockport's netminder Matthew Schneider picked up his fourth win of the season with 11 saves on the night. The College at Brockport ice hockey team defeated Morrisville State Friday night, by a score of 6-1. With the win, the Golden Eagles move to 13-6-2 overall and 5-5-2 in conference, while the Mustangs fall to 4-14-2 and 2-10-1 in the SUNYAC. The first period was all Brockport as freshman forward Trevor Pray got the Golden Eagles started, scoring ten minutes into the period with the assist coming from Shane Visnick. Four minutes later it was the Golden Eagles again, this time freshman Mitchell Parsons was the goal scorer, beating the Mustangs netminder through the wickets with the assist to Jordan Renaud. Thirty seconds after the Golden Eagles second goal, Pray was at it again, scoring his fourth of the year and doubling his goals on the season. 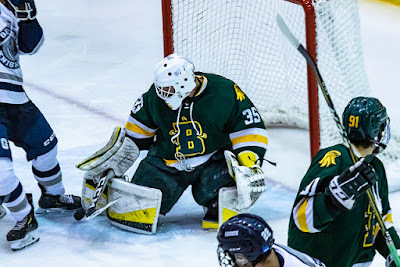 The Green and Gold wasted little time in the second as Captain Connor Hutchins buried his sixth of the year six minutes into the period after a cross-crease pass from Ethan Solat. The Golden Eagles continued to pour on the pressure, extending their lead three minutes later as Parsons found Ethan Solat for Brockport's fifth goal of the night. The Mustangs answered 40 seconds later, scoring their first goal on the night on the powerplay to bring the game within four. Brockport outshot the Mustangs 18-6 after two periods. The Golden Eagles were held off the scoreboard for 15 minutes in the third, the longest they went without a goal all night. Hutchins scored his second goal of the game on the PP, with assists to Hunter Laslo and Jeremy Solat, the goal game with 4:45 remaining in the third. Matthew Schneider picked up his third win of the season with 10 saves. Brockport heads to Morrisville for a weekend twin bill. There is a 7:00 game Friday and a 4:00 matinee on Saturday. These are MUST WIN games for the Golden Eagles. The Mustangs are only 2-9-1 in conference play, 4-13-2 overall. Brockport cannot overlook that record and must play with conviction and energy and win two winnable games. If the Golden Eagles lose either game it's nearly certain they won't host a first-round playoff game (although it's likely they will make the playoffs) with 2 of the next 3 opponents being Oswego and Geneseo, two really tough teams. The players and fans want a home playoff game -- and the players deserve one with the great season they've had. There's nothing better than hosting a playoff game. Winning in Morrisville keeps that hope alive. They have to be careful, as three Morrisville players will give the Golden Eagles fits. Containing CJ Stubbs is like trying to catch lightning in a bottle. The Mustang senior has 13 goals on the season, including 5 with the man advantage. His linemate Nick DeVito is none too shabby with 8 goals. Like Stubbs, 5 came on the power play. And, he has a shorthanded goal. Jared Young will likely start in goal. The junior has been hot in goal this month with save totals of 49, 39, 42, and 37. If the season had ended this weekend, Brockport would be traveling to Plattsburgh for a playoff game. BUT, the season didn't end Saturday. There are still five games left. That may not seem like a many games, but a lot can happen in five games. The outcome we all want -- Brockport hosts a playoff game. Brockport has the focus, work ethic, talent, and underdog motivation to do just that!